Auction Decorating: The classical sofa - 'at auction'! The classical sofa - 'at auction'! Designers like Darryl Carter know how to use antiques in contemporary decor. 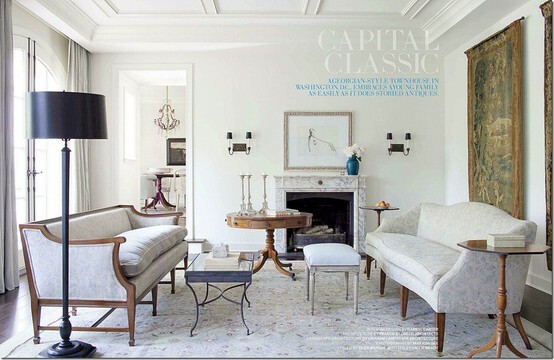 I love his use of classical sofas and daybeds! Darryl Carter's room are so fresh and modern, while using classic antiques. The wood framed sofas and daybeds have style and interest. The wood adds warmth to the white interiors. This is a lovely example of a 19th century Empire mahogany sofa. It has wonderful carved detail, and elegant scrolled arms. This is in the next Copake Auction in Copake, NY October 20th. This is Lot 54 and has an auction estimate of $500 - $700. This early 19th century mahogany sofa also has graceful curved arms, and more restrained carved details. The upholstery needs to go (! ), but the style is all there. This sold at a Brunk Auction in Asheville, NC for $900. This American classical mahogany sofa was made circa 1825. The scrolled arms are even more pronounced, and I like the salmon striped upholstery! This sold at a New Orleans Auction earlier this month for $522 off an auction estimate of $400 - $700. For something a bit more masculine, here is a leather upholstered option. This is Federal style, circa 1880. This is included in the October 20th auction at Kamelot Auctions in Philadelphia with an auction estimate of $700 - $900 (Lot 49). I love the look of a daybed in a living room. This may not be the comfort option, but it can be very elegant. 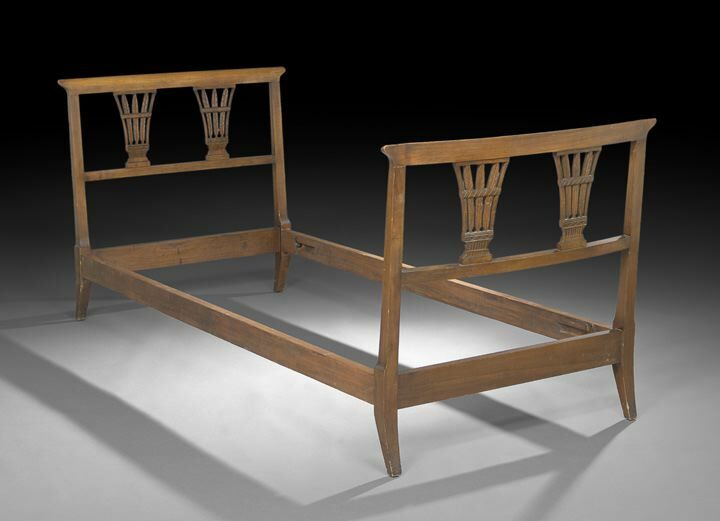 This Provincial Empire fruitwood daybed is late 19th century and sold at a New Orleans auction for $922 off an auction estimate of $400 - $700. The carving is wonderful. 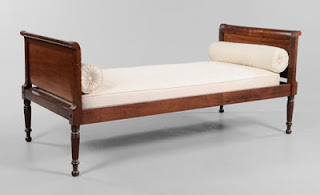 This is a very refined Duncan Phyfe daybed. The mahogany is rich, and the white upholstery is the perfect choice to set it off. This sold at a Brunk auction for $1,000 off an auction estimate of $1,500 - $2,500. All these example incorporated in to a room painted white, with white upholstery would be an excellent way to create a Darryl Carter look!